The Shark company are always releasing new accessories and models to their range – and the Shark Duo Clean is another welcome addition. With the introduction of so many new models, it’s not surprising that potential customers can sometimes struggle. In this review, we will examine the Shark DuoClean and explain the differences between each of the models. What is the Shark DuoClean? Does my Shark come with the TruePet mini motorized head? How does the Shark compare to the Dyson? Can I used the Duo Clean on laminated floors? Once you understand that the Shark DuoClean is actually an innovative new head that’s been combined with several existing Shark vacuum cleaners, everything becomes a lot clearer. The Shark DuoClean is technically not a vacuum cleaner. The Shark DuoClean is a Shark accessory added to some of their previous models to create an entirely new range. For example, the HV381 uses the same body and motor format of the HV321. But by adding the new DuoClean head and slightly increasing the motor power, the HV380 range of products were created. In fact, the HV380 range has all the same options as the HV320 range. As an example, the HV322 Shark Rocket True Pet has become the HV382 Shark Rocket DuoClean TruePet (with the mini motorized head) by adding the DuoClean head to the previous design. Unlike previous models, the DuoClean vacuum has two rollers built into the head. The soft front brush at the front of the unit is designed to pull in large debris and to pick up fine dust. The larger nylon brush is designed to assist the suction by agitating anything left on the surface you are cleaning. When you are working on hard floor surfaces, the front brush does an excellent job of picking up the finer dust that is often missed by other vacuum cleaners. The rollers don’t rely on the suction power to make them rotate. Their speed is electronically determined by a switch located on the main vacuum cleaner and the brushes are driven directly by cogs located in the DuoClean head. Because the head is designed to work on hard surfaces, Shark has also included fine "guard" brushes around the perimeter that serve two purposes. When the roller brushes are turning, they flick the debris towards the back of the cleaning head to be picked up by the main suction. The guard brushes around the perimeter stop the debris from going behind the vacuum cleaner head. The side brushes have a secondary function to get close to edges and baseboards. They do an excellent job of this. However, you will notice that one side has a plastic gap between the side brush and the main rollers. This is where the cogs that are driving the brushes are hidden. The cleaning head doesn’t do as good a job when you put this edge against the wall. The other side brush is really close to the rollers and does an outstanding job of capturing the dirt and debris from baseboards. The DuoClean head is exceptionally good at picking up hair from carpets and hard surfaces. While most hair is easily removed from the brushes, very light and fluffy hair from Persian cats can be harder to remove from the large brush. The coarse hair from other dog and cat breeds is not an issue. The easiest way to remove hair from the rollers is to remove the top cover (called the garage) and to use the tool provided with the unit. The brushes easily come out of the unit for cleaning. The front roller is removed by pressing a button on the side of the vacuum head. Removing the crushes makes the cleaning process a lot easier. When the cover is off you will be able to see a dedicated hair removal tool at the rear of the unit. The cutting tool snaps out and is designed to be run up and down the grove in the roller to cut any trapped lengths of hair. In our experience, it’s a good idea to clean the rollers regularly. If you leave them too long, the hair tends to wind tighter and is more difficult to remove. If you leave the removal for too long, you will need to use the Shark tool to lift the hair away from the rollers, and then revert to using scissors to cut the actual hair strands. The hair removal tool also has a small bristle brush on one end to clean the channels around the base of the vacuum head and the teeth beside the soft roller located at the front of the unit. If anything gets caught in the rollers, the machine will automatically shut off. It also won’t run if the garage cover is not properly closed. The unit has a light on top of the DuoClean head that normally glows green when the vacuum cleaner is in use. In the case of an auto cutoff, the light will turn red and the machine will stop functioning. The front roller is very effective at pulling in dirt, hair and other debris (including string). You need to be VERY careful that you don’t run over power cords. Unlike other machines, the DuoClean head will instantly pull power cords directly into the rollers. It doesn’t matter if it’s a relatively thin phone charger cable – or a full-size power cord (like the one that powers the Shark). The front roller is incredibly aggressive at what it does, and for your own safety, please avoid running over power cables. Like other Shark models, this DuoClean cleaning head has bright LED’s that act as headlights and allow you to see dirt and debris in poorly lit areas. We note that having a roller at the front of the unit means the LED lights are set slightly higher than their previous designs. This doesn’t cause a problem and is merely an interesting observation. Before the DuoClean was created, Shark had the Powerhead. The Powerhead had a single roller that could be swapped out depending on the surfaces you were cleaning at the time. It also had the dirt canister built into the vacuum cleaner head. With the introduction of the Rocket DuoClean, there is no need to change the roller head between cleaning surfaces and you can swap between carpet, rugs and hard floors without stopping. Many of the earlier Shark models included the Dust Away cleaning accessory within the box. By using microfiber cleaning cloths, the Dust-Away attachment was great at removing dust from hardwood floors. With the introduction of the soft roller at the front of the Shark DuoClean, there is no longer a need for the microfiber cleaners. The front roller does an outstanding job by itself, and for this reason, the Dust-Away attachment is not included when you purchase any of the new DuoClean models. 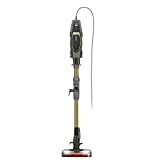 The Shark Rocket has gone through several iterations over the years, and with the addition of the DuoClean head, the newest HV381 and HV382 models allow you to vacuum almost any type of surface without skipping a beat. With the huge range of supplied accessories, you can clean carpets, rugs, hard floors, window ledges, baseboards, curtains, blinds, cabinets, roof fans, and vents. If you add on the car detailing kit, this versatile unit also allows you to vacuum your car, truck or other confined spaces. The latest Shark Rocket models have a slightly larger motor that consumes 600 watts. This is 100 watts more than the HV320 range. The dust container has been increased to hold 0.25 gallons (approx 1 quart) before it needs emptying. This is twice as much as the original HV300 Rocket, and the same as the HV320 range. During testing, we found this was normally sufficient to clean an average size house. However, if we were doing a deep clean or the vacuuming hadn’t been done for while the dust container may need emptying once or twice. The unit is quite light at 9.9lbs. This is a little bit heavier than earlier Rocket models – with the main reason being the larger vacuum head and stronger motor. The thing we really like about the Shark Rocket range is that it can quickly convert to a handheld vacuum cleaner. With the reduced size and the wide range of accessories, this is a really versatile machine. The following video gives a quick overview of how the Shark Rocket converts from an upright into a portable handheld vacuum cleaner. Note : Don’t be fooled by the fact the HV382 is often less expensive than the HV381. The HV382 is definitely a better choice as it also includes the TruePet mini motorized brush accessory. The Shark Rocket DuoClean Ultra-Light is competitively priced and delivers when it comes to accessories and versatility. This is a good choice if you clean your house on a regular basis and don’t need to do deep cleaning of large areas. If you have a huge house or live in a dusty environment, you may need to empty the dust cup multiple times during a cleaning session and this will eventually start to bother you. The fact it can’t stand up by itself bothers some people. This has been addressed in the more recent (and expensive) Flex models. We especially like the way the upright vacuum cleaner can convert into a portable vacuum, and that the entire range of Rocket accessories can be used when it is in the portable configuration. If you have allergies, the Shark Rotator Lift-Away model may be a better choice. 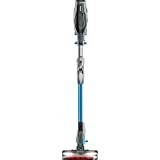 The Shark DuoClean Rotator is more like a standard upright vacuum cleaner than the Rocket, with a large dust canister and a powerful 850-watt motor. If you have allergies, this is the model to go for. The motor has three filters – including a really good HEPA rated filter that the manufacturers recommend replacing yearly. The other two filters can be washed and put back into the vacuum when they are completely dry. The dust canister is nearly 3 times the capacity of the Rocket upright machine. Because of its size, it won’t fit easily under furniture and low places. Shark overcame this limitation by creating the Lift-Away design. By clicking a button, the main canister can be removed from the cleaning head to allow the vacuum to get into quite low places. This is also extremely helpful when you want to clean over your head or curtains, shelves etc. With the introduction of the DuoClean and TruePet heads (which both require power), they further enhanced this model by creating the "powered" lift-away. The powered design means it can use the DuoClean and the TruePet powered head attachments. Have a look at the video below to see them in action. The power switches are located on the top of the handle to avoid you having to bend down to change the settings. The three-speed settings and the DuoClean head allows you to move from hard surfaces to the carpet and back again without changing the head. We really like the way you can do most of your cleaning with a single cleaning head. The TruePet mini motorized cleaning head is excellent at removing stubborn pet hair and debris from floors, upholstery and mattresses. After using the Shark Rocket, you quickly come to appreciate the extra capacity of the Lift-Away dust canister. This machine is quite a lot more expensive than the Shark Rocket and doesn’t have the same portability options. However, it feels more like a standard vacuum cleaner and the Lift-Away functionality makes up for lack of portability. We like the way the unit is supplied with a HEPA rated filter, and the way it can stand upright by itself. If you want the TruePet mini motorized brush, make sure you get the NV803 instead of the NV801 or NV800. By adding a flexible hinge in the middle of the cleaning wand, Shark created an ingenious way to get under beds and furniture without having to bend down, or kneel on the floor. A small button located on the back of the wand releases the hinge to allow you to fold the wand forwards. The new MultiFLEX wand has the added benefit of reducing the height of the vacuum cleaner to 49 inches for storage. It also allows the Flex DuoClean to stand upright under its own weight when it’s not being used (a common complaint of the Shark Rocket range). At only 9lbs in weight and with a 600-watt motor, the rest of the features are the same as the highly popular Shark Rocket DuoClean range. The Shark can be used as an upright cleaner, or as a portable handheld unit. The addition of the MultiFLEX hinge means the onboard tool storage had to be removed from the design. If you’re using the vacuum cleaner for general work, the DuoClean head handles most surfaces anyway – so it’s not that big a problem. The 30ft cord can be quite annoying at times. While it gives you extended cleaning range, catching the cord in the front roller of the DuoClean is something you want to avoid at all costs. The DuoClean is quite aggressive and will grab the cord without hesitation. Anti-Allergen Complete Seal Technology captures and traps 99.9% of dust and allergens inside the vacuum – including many pollen, plant spores, pet allergens and other particles – down to 1 micron. The website says that this is based on the ASTM 1977 standard and means the filters are not HEPA rated. The user manual recommends cleaning the pre-motor filters every month and the post-motor filter every 9 months – or whenever the suction power is reduced. Note : Only the HV392 model includes the TruePet mini motorized brush. The flexible wand is certainly an improvement on the original design – but we’re not sure it’s worth an extra $50 to $100 over the cost of the HV382. If you have a problem bending over or getting under things, it may be worth the extra cost. Our advice is to get the HV382 which includes the TruePet brush. You’ll get more bang for your buck and eventually, the HV392 will come down in price. If you want the Flex model and mini motorized brush, make sure you get the HV392 instead of the HV391 or HV390. 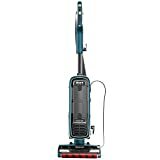 If you can’t get the HV392, you can still buy the HV391 and purchase the motorized brush as an extra accessory (or use one of your old Shark vacuum cleaners). Dyson has had cordless vacuum cleaners for a long time now and it seemed like Shark was lagging behind. However, Shark has finally come out with the Shark IONFlex cordless vacuum. 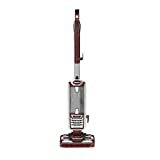 Based on the popular Shark Rocket design, the cordless model can be used as an upright cleaner or a handheld portable unit. The Shark IONFlex IF201 is supplied with a single Lithium battery that lasts for around 20 to 30 minutes on a single charge. The more expensive IF251 comes with two batteries and a standalone charger. When the vacuum cleaner is not being used the IF201 can be plugged into the wall to charge the battery without removing it from the cleaner. At around 3 to 3.5 hours, the charging time is relatively long and you can’t run the unit without a battery. The addition of the MultiFLEX hinge in the cleaning wand means you don’t need to kneel or bend down to get under beds and furniture. Unlike the earlier Rocket design, the IONFlex can be stored upright without needing to use a wall hanger. The MultiFLEX connection allows you to bend the wand forward nearly 180 degrees to store the motor down near the cleaning base. As you can imagine, this also reduces the height of the vacuum cleaner significantly and allows it to be store below shelves or in cupboards. It’s been a long time coming and the wait has been worth it. The Shark cordless vacuum has the power to clean for 20 to 30 minutes on a single battery charge, and with two batteries it means you can do almost an hours cleaning before waiting for a recharge. because of the long charge times, our recommendation is to get the model with two batteries (IF251) and to start with a different battery each time you use the vacuum cleaner. If you have allergies, you don’t really have another cordless option. In this case, we recommend you go with the HEPA rated Lift-Away model instead. For all the bells and whistles and the most powerful vacuum cleaner offered by Shark, you need to look no further than the Shark AX951 and AX952. This model is large, solid and powerful. Holding 1.5 quarts (or 1652 ml) of dust and dirt, it has the largest dust canister in the range. You really don’t have to examine the unit closely to realize that the vacuum cleaner is built to work hard and would be suitable for some small commercial cleaning applications. The 1,350-watt motor produces significant suction and the rollers in the DuoClean unit are larger and more solid than the Rocket and other Lift-Away models. When it comes to filters, Shark has outdone themselves. The machine comes with 3 washable filters. The post-motor engine is HEPA grade and the filter is sealed with a system Shark aptly call the "Advanced" Anti-Allergen Complete Seal. The website indicates that the filters are capable of removing 99.9% of dust an allergen particles measuring as low as 0.3 microns. Only the AX952 comes with the mini motorized TruePet attachment. Make sure you check the included accessories when you order your vacuum cleaner. If you end up buying the AX951, you can purchase the TruePet attachment separately – as it works on both models. The vacuum cleaner isn’t light and comes in weighing 16.2 lbs. Even though this is one of the biggest units, Shark have worked hard to reduce the noise output to a reasonable level. The biggest and most expensive model offered by Shark. If you are looking for an industrial strength HEPA graded vacuum this is the machine you want. I’ve even seen people using this model for light commercial cleaning work. Even though the machines get fairly well beaten up by the workers, they seem to keep on working (as long as you regularly clean the rollers). Amazon often has this item marked down enough that they are the same price or cheaper than the NV801 and NV803 models. Just make sure you check the included accessories and if the motorized TruePet brush is included or has to be purchased separately. If you end up buying a model without the TruePet, you can still buy the attachment and use it on compatible models. Compatible with the following models: NV650, NV650W, NV651, NV651Q, NV652, NV750W, NV751, NV752, NV753, NV755, NV765, UV795.. Important: These attachments also work on other models that are not specifically listed (EG the HV380, HV381, HV391, NV801). Make sure you order the correct attachment as there are at least 10 variations and you need to order the brush that matches your vacuum cleaner model. At this stage, neither of the IONFlex models include the TruePet attachment. Shark considers the Dyson to be their major competitor and have made a series of videos that compare similar models. Shark is always trying to stay one step ahead with features, versatility or performance. In most cases, the results for other models are the same. Remember that this video is produced by Shark and the results should be taken with this in mind. This is what the DuoClean excels at. In fact, the DuoClean is designed to work on carpet and hard floors without changing brushes or accessories. The Shark range has a switch on the handle that allows you to change the speed of the rollers as you swap from one surface to another. Shark Clean offer options for almost every situation, and there is no question their vacuum cleaners are some of the best on the market. With the addition of the DuoClean head the Shark range is easier to use and allows you to clean carpet and hard surfaces without messing around searching for differnt brushes or attachments. If you like the idea of an upright cleaner that converts into a portable handheld unit, the HV382 is our cleaner of choice. The range of accessories and the inclusion of the mini motorized TruePet brush make this a good deal. If you have allergies or are looking for a solid model that has a large dust capacity, the NV803 is what you should be looking for. And finally, if you are heart set on getting a cordless model, the IF251 (with two batteries) is the unit to go for. Having two batteries means you don’t have to stop halfway through cleaning the house. This doesn’t come with the TruePet attachment that you get with the HV382 though. In the end, it doesn’t matter which model you choose – we are certain the Shark DuoClean range will serve you well.